Selling old electronics for cash can be a win-win situation. 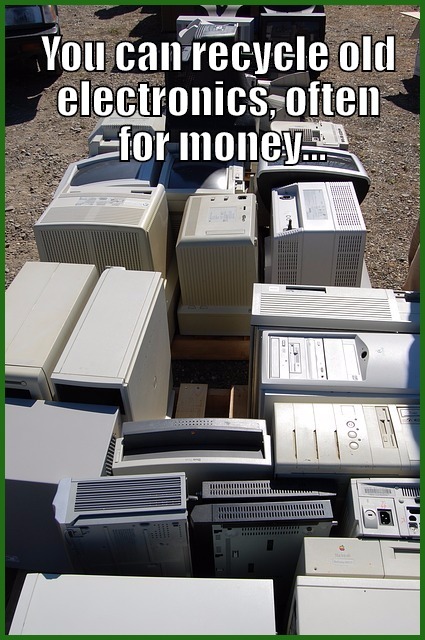 You make some money and the old computer, printer, cellphone, or other electronic item stays out of the landfill. How to do it depends on where you live. If you are in or near a city, you can take things to places that accept them. If you are in a more rural area, you can send them in, often at no cost. Staples is also known for taking trade-ins for an amount of money you can use in the store. You can do it by going there or by using the online form, as this page explains. Amazon takes trade-ins of things you bought from them in exchange for store credit. This can include books and other non-electronic things. Details here. So that gives you some choices. Whether it’s a hard drive or something else, you need to clean up all that data. Just erasing your laptop doesn’t do it. Here’s a good article about how to get rid of old electronics, with details about backing up and cleaning data off. So selling old electronics for cash can certainly be done. If you would rather donate to a non-profit, check out the national Cristina Foundation. If you decide you’d like to make money recycling electronics and other items, here is a link to a webpage about an ebook on the subject, from a guy who has been doing it for years. One way or another, it’s always good to get rid of old stuff you have no use for. No, I don’t buy anything but the article has some ideas. I don’t, Lynn… I suggest you ask around Plainfield or do a google search that says both your town and state name and something about selling old computers. Joe, I don’t know! Try some of the sites and try googling for more. I have a large quantity of broken tablets. I still love my teen age boys, lol. Don’t know where to go, (site), or (store). I would love for it to be somewhere I can get a little extra cash. Thank u very much ? This is the kind of comment that I don’t always approve, but the info does look potentially useful! Hey there, some useful information here. I’ve also found the need for getting rid of new/unused toner instead of recycling. The site http://www.tonerconnect.net/ helped me with toner I had piling up at the office. My husband and I were remembering that some years back we had to pay to get things recycled. Better now. Good information here. I’ve always just taken my old electronics to the recycle place. I didn’t even realize I could be the one getting paid to recycle them! I didn’t really know how to go about it. Thanks for the advice, Zana!